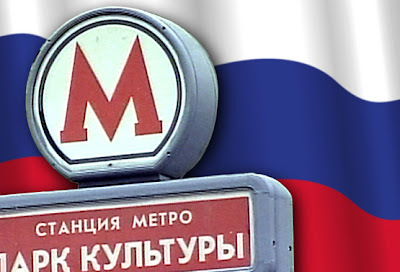 SUICIDE BOMBINGS IN MOSCOW METRO SUBWAY STATION……. – The Tundra Tabloids……. SUICIDE BOMBINGS IN MOSCOW METRO SUBWAY STATION……. UPDATE: The Sheik reports that the death toll has risen to 37 and that it was two female bombers who were involved. March 29 (Bloomberg) — Two explosions at the Moscow Metro in the city center killed at least 34 people and left at least 24 people injured, an Emergency Situations Ministry official said. The first explosion happened at the Lubyanka station before a second blast was reported at the Park Kultury station, said Irina Andrianova, a spokeswoman at the Emergency Situations Ministry. The official, who declined to be identified, said 22 people were killed at Lubyanka and 12 at Park Kultury. Interfax also reported that a suicide bomber was responsible for the Lubyanka explosion. Previous Post Previous Post ANTI-SEMITE HAWASS PROUD OF SLAP TO JEWS IN EGYPT FOR PROVOCATIVE DRINK……. Next Post Next Post US GOVERNMENT UNDER OBAMA GETS TOUGH ON DOMESTIC MUSLIM EXTREMISTS…….NO WAIT.. This is so terrible disturbing. Praying for the people of Germany and for the families who are suffering the loss of loved ones. The "Nation of Islam" at work. Russia 'occupies' some Muslim land. They must be driven out. "Religions" do not defend land, nations do. No wonder the Islamic world has so much violence and warfare. Islam has not accepted the concept of the modern national government.